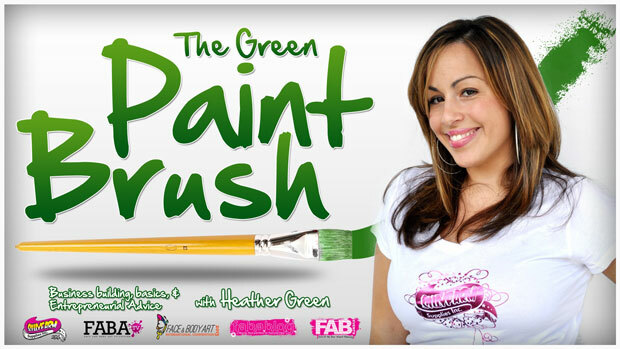 This is the first installment in The Green Brush, a Marketing and Business tips and tricks series by Heather Green. sponsored by Silly Farm Supplies. I have spent the past six years making youtube videos on face painting to help you to become better painters, but I totally neglected that being the best painter isn’t good enough. It’s like living on McDonald’s, but then working out every day of the week. You have to combine business skills with talent in order to achieve a winning combination…. So I am dedicating one video blog a month to helping you improve your business, grow your business, and answer your questions. What makes me qualified to be in a position to give advice? For those of you that don’t know me… My name is Heather Green and I am the owner of Silly Farm Supplies, the creator of FABAtv, the co-producer of the FABAIC, publisher of the FABA Blog, a business partner for My FAB Events, a mom, a friend, a face & body painter, and the First Lady of Greater St Mark Ame church. I have been painting for 15 years, have grown my companies into something I am very proud of. I spend much of my time researching, reading, and investing in learning how to be a successful entrepreneur. My goal is to condense my findings into useful information and business advice that you can use and make money from. I feel my face painting Youtubes and teaching style have been so well received because I take a lot of concepts from all the classes I have taken and simplify it to make it attainable for all levels of painters. I want to do that in the business sense too. My business video blogs are meant to help anyone, not just painters, but all entrepreneurs and aspiring entrepreneurs. I know that watching my face can be boring, but hopefully the content will make it all worth it. My goal is to publish video blogs at least once a month. If you like them I will try my hardest to post 2 a month. So what’s on the agenda for today? In order to get ourselves in the business frame of mind there are a few things you need to do to get started on the right path. Start with time management…. There is a direct correlation between time spent/ invested and success. When I bought silly farm almost 9 years ago I told myself I wouldn’t take a paycheck until we were out of the red. I face painted on the weekends and used that money to live. I didn’t mind working 19 hours a day, and I believe that my time spent obsessing, building, growing Silly Farm is the reason we have grown from 2 employees to 27 employees. If you are only spending two hours a week improving your company, investing in yourself as an artist, or your phones aren’t ringing like you would like then it’s time to take a look at how you are spending your time. I wrote the book on No Time. I get up at 5:00 am, go to the gym, get home to get my son ready for school, go to work, go home, feed him, bathe him, and then go back to work. Now my life style isn’t for everyone, but if you don’t make the time, you can’t expect the results. Start by dedicating one hour a day to yourself and your business. Spend an hour emailing customers, or taking a class on FABAtv, or seeking new leads. If you invest an hour each day it’s easier to increase the time you spend on your business daily without feeling overwhelmed. How many times have you said to yourself I just want to loose 10 lbs or 20lbs? How many times have you said tomorrow I am going to eat better and start laying weight? For better or worse, goals are a huge part of the human psyche. Goals are important because they help create vision and focus. Set, type, and print your goals, make them visible at all times so that you don’t loose sight of what you are working towards. When I launched fabatv I printed a paper out that said 1,000 subscribers … Ready set go! Every morning I looked at my goal and within 9 months I reached my goal. I wish I could say the same about these last 8 baby pounds, but I won’t be too critical. If you make a goal to book five new parties a month, or a goal to save 30% of all your take home, then you keep it where your mind continuously views it. Then you will train yourself to keep the pot at the end of the rainbow in mind. Don’t let your goals become out of sight and out of mind. We learn from others and feedback is essential! Please like and share this post if it helped you. Leave a comment below or send me an email if you have any questions! Who knows, maybe your question will be on the next video! This entry was posted in Marketing & Business Tips, Videos & Tutorials and tagged advice, agenda, business, goals, Heather Green, marketing, silly heather, Tips, Tricks. Bookmark the permalink.